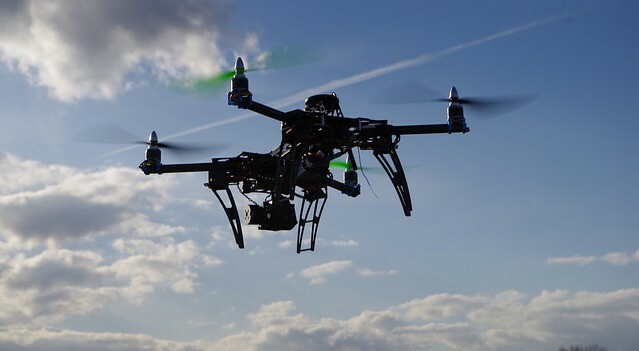 Drones serve a multitude of different purposes which range from: monitoring the security of assets and inventory, surveying hazardous locations or restricted areas e.g. – The Tian-jin firecracker explosion site or earthquake-toppled buildings, working condition of machinery and warehouse equipment, they are used as part of assembly lines to rapidly transport packages, loading trucks/cargo ships etc. They now form an integral component of big e-commerce companies like Google and Amazon and are used to improve delivery times. Delivery drones come in different sizes and can be modified to be the best fit for a task. These drones’ types can be cargo drones or drone vehicles to modified surveillance drones which can be used to automate the logistics component of stocking and handling inventory. Drones can circumnavigate harsh terrains such as jungles or hills or mountains and often create a much shorter and direct route compared to traditional transportation means. Drones are not stuck in traffic jams or queues or lines as they can avoid transportation infrastructure. They are however hampered by wires or large trees. They can deliver packages with precision and care due to their VTOL capabilities. Think of it as a GPS + pinpoint accuracy. Does not require human intervention and the process can be automated over time with machine learning based investment. Delivery drones are also being experimented and modified as part of the IoT technology (Internet of Things). Companies which specialize in drone deliveries are cropping up such as Flirtey which lets customer’s book items via smartphones, track the package via GPS, and receive it at an outdoor location or designated coordinates. Drones sometimes cause privacy or security issues and are subject to being ‘gunned down’. They also have to adhere to the local laws. They require good sensors for weather detection, avoiding power lines and trees. Many companies are contemplating the possibility of joining this trend of delivery drones. Do you think this will bring more engineering challenges to the table?